Field guides to Birds, Wildflowers, Trees and Mammals now available on iPhone and iPod Touch, more nature subjects to come. Features like bird calls, GPS-location and the ability to share outings with family and friends are just finger taps away. These new apps transform field guides as we know them. The best-selling series of National Audubon Society field guide books have gone mobile, putting the most authoritative and comprehensive information about the natural world at the fingertips of iPhone and iPod Touch users. The first four Audubon Guide apps in the new series – North American guides to Birds, Wildflowers, Trees and Mammals – are now available in the reference section of the apps store in iTunes. The apps provide a wealth of interactive information in a mobile package, giving nature lovers and outdoor enthusiasts a fun and exciting experience that makes outings richer, more informed and instantly sharable. Audubon Guide apps use updated and expanded content from the authoritative National Audubon Society guide books to cover thousands of species. Features include more than 8,000 professional color photos, 2,300 bird sounds, thousands of range maps, and in-depth species descriptions with updated information about behavior, habitat, and the natural history of families and species. All of this is wirelessly accessible in real time through elegant, interactive and intuitive search features. Search parameters include common and scientific names, family, shape, range, habitat, color, and size. "This is a giant leap forward in connecting people with the nature that surrounds them,” said John Flicker, president of the National Audubon Society. "And it’s the first step in building a commitment to protecting the wonders these apps will help a new generation discover and savor." The apps’ geo-location search features also allow users to find which species are located where they are, or in any other zip code, state or region. A universal dashboard enables navigation back and forth between species information, search functions, sightings, and more. When loaded onto a user’s iPhone, the apps work independently of cell phone connectivity. Other innovative functions include the ability to create personalized life lists, post GPS-enabled sighting lists, and upload user-created photo albums. 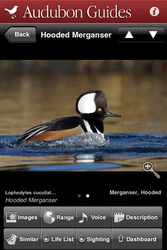 The apps are supported by AudubonGuides.com, a free companion Web site that syncs with the apps. The Web site features all of the comprehensive subject matter found on the apps, as well as scientific news, user forums, articles and blog posts contributed by nationally recognized scientists and naturalists. The four initial apps are now available at introductory prices in Apple’s iTunes store. The limited-time-only prices are $19.99 for Birds and $9.99 each for Wildflowers, Trees and Mammals. Birds, Wildflowers, Trees and Mammals will be followed in the next few months by mobile guides to Insects & Spiders, Butterflies, Fish, Reptiles & Amphibians, Seashells, Seashore Creatures, Mushrooms, Whales & Dolphins, and many other subjects. In this way, the Audubon Guide app series looks to deliver all of nature to peoples’ fingertips.